A good hair cut has the right proportions and includes all the basic elements of balance, line and movement. The cut should be manageable and the hair should look great in its natural form even before it is styled. How Do You Find What Works Best For Your Face? Choosing the right hair cut is part technique and part art. One helpful technique is to adapt certain haircuts to certain facial structures as each face has its own unique structure. The shape of your face and head has a major role to play in the type of hair cut and style you can wear best. Use this guide to find hair cuts suitable for different face shapes. 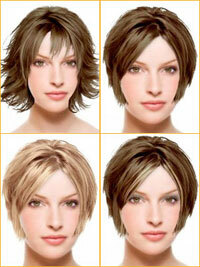 For visual aid you can test a new hair style before getting the cut, by using virtual hair styling or imaging software. It's the only "easy" way to try out a hair cut before the first snip is made! In the older days, we used to go into a wig shop and try different looks (which was interesting and entertaining to say the least!) Today, however, with all the technological advances you don't have to go through all that troubles. All you need is a portrait photo of yourself and you’re ready to go. Finding a new haircut is not only about facial structure. It also depends on manageability. Take your hair texture into consideration. The shape and type of hair cut makes the difference between having an easy hair style and a style that becomes difficult to manage. Here are some few ideas on how to find easy hair styles. Try not to mistake fineness for thinness and coarseness for thickness. Hair falls differently with each texture. For example, fine hair might require layers but thick hair could get out of control with too many layers – so narrow it down to those that work with your hair type. You like to stay with your current hair length, but fancy something different? Go for a light re-design and not just a haircut! You can change the shape of your hair cut by adding texture and by adding a little hair color and taking a few snips, you can morph your style to create something new. Then it’s all about having fun. You have the option to experiment with your style. Normally I don’t advice you to go short but most girls in your age are wondering if short hair is great for school or not! – I would say you should try anything you want. Life’s too short to not experiment with your hair! Then you should be confident enough to choose your style. If you have a busy lifestyle, you'll want a cut that requires minimum care. Usually, this means a shorter look. Certainly your profession dictates your choices but if you want it trendier, add some length but also make certain you still have styling control and neatness. Sometimes commitments to career, home or family takes you away from your own needs. Without compromising your own glamour, try to focus on practicality. Look for easy-to-wear hair cuts that look stylish. Look back in time when you were younger and embrace change! Creative hair coloring is a great choice if you feel funky and like to experiment a new look. Use it to enhance your personality and complement your hair cut and making it unique to you. Don't be afraid to experiment, but choose a trusted stylist for this kind of work. 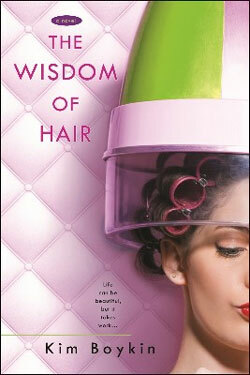 The Wisdom of Hair is about a young woman's need to change her life and put her troubled past behind her like a bad haircut.